You all have probably figured this out by now, but.. I am an undergrad at Duke Univ (currently in my fourth and final year!). We have these things called food points, which are basically pre-paid dining dollars that we use to eat at any dining location on campus. On Saturday, a few friends and I decided to visit Nasher Museum Cafe – one of my favorite dining places on campus, and luckily for us students, where we can use our food points! It was really delicious. In my opinion, of course, it could have used more aioli, but that’s probably not the healthy way to go. 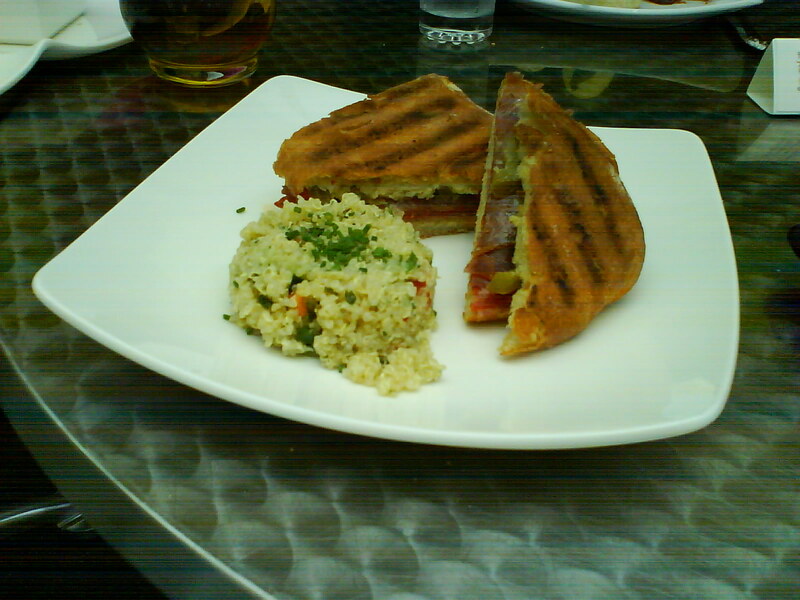 The quinoa salad was also splendidly refreshing. The ciabatta bread was fresh, nicely toasted. We had also ordered a cheese plate, which featured three different types of cheese: brie, cheddar, and cream cheese & chives spread, served with sesame crackers, grapes, and macadamia nuts. I’m not an expert on cheese, but I do know that the cream cheese spread was really good… and my friend, who is much more cheese-savvy, absolutely loves the brie, so I’m sure she would recommend the cheese tray if you are there with a larger group of people. Overall – the cafe offers such a wonderful dining atmosphere. Somehow the idea of dining in an art museum just is really.. lovely. If the place is not crowded, you can request a seat by the window for a peaceful view of the outside. A worthwhile venture indeed.